We've all heard some version of "do what you love and you'll never work a day in your life". Call me Pollyanna, but I wholeheartedly believed that; that is, until I started working in one of our province's public libraries. Don't get me wrong, I grew up thinking of libraries as a magical place filled with tickets to places I could only get to in my dreams. Because of my library I was a little pioneer girl living in the big woods with Ma and Pa, a red-headed orphan on a farm in in P.E.I, a lost boy in Neverland, one of the March sisters ensconced at home with Marmee waiting for news of a father away at war, Encyclopedia Brown on the case, and the main character in any number of choose-my-own-adventures. Lessons I learned from literature shaped who I am, and how I choose to live my life. As it was for countless others, my local library was a repository of imagination, and a safe place to read, explore, learn about the world and find myself. The thought that I could somehow make that experience possible for children and adults as a career was irresistible to me. I realize now that my childhood was a lucky one; my parents felt the same way that I had and instilled that belief in me. They, of course, grew up without a public library in their town. Both were voracious readers who had parents who believed reading and education were the single and most important gifts they could offer. In fact, they sacrificed to ensure they provided that gift to their own children. My parents believed that the public library was the crowning glory of our community and they made sure we didn't take it for granted. When I was finally offered a job in one of our public libraries I had an idea of what my role would be. I had substituted for a while and understood that everyone who walked in the door wasn't looking for the magical experience I had been looking for, though many of them were. But it took working in my library for a few years before I really understood the role libraries play in this province. It's not always about Knitting Groups, Seniors' Days, Adult Colouring and Storytimes. It's not about checking TV Series and movies out to people who can't afford cable, or watching people come in day after day to check Facebook and job listings. It's not the ones who print off resumes and fax them to prospective employers. It's not the people who come in desperate to read the latest James Patterson, or Nora Roberts or Clive Cussler book or the kids looking for Butterfly Fairies or super hero books. I am devastated for the children in this province, the ones like me who will read every children's book we have and then start on the adult collection. They still exist, and they need to be nurtured, because some of those children who are turned on to art, literature and imaginary worlds will be the ones who are just imaginative enough to run this province in the future, or maybe they'll be part of our vibrant and resilient arts community. Perhaps they'll be entrepreneurs who create jobs for hundreds in this province, or the teachers who inspire future generations. What they probably won't be, are librarians, and that makes me ache. Still, they're not the ones my heart aches for the most. In my years in the public library, I've had the privilege of serving patrons from all walks of life. Indeed, the ones I see the most of are the marginalized; people who are ignored, looked over and treated by many as though they don't exist. These people need our libraries, and they need the kind treatment they receive in them. Some people visit my library, and I know for certain that I'm the only person they speak to on a regular basis. This means something to me, and I know it means something to my colleagues all across this province. I've had seniors spend nearly every hour we're open at our library, and after getting to know them I discover it's not because the library is a place filled with books and imagination, it's simply because they get a little conversation, they can read the newspaper, maybe a book and surf the Internet in a room that is warm. The truth is, they can't afford to heat their homes, so they turn their own heat back and head to the library for the day, every day they can, to save money. I've had two women come in to hide from abusive situations, and gave them information about shelters and hotlines, and prayed I'd see them again in a better situation. I've welcomed new Canadians and assisted where I can with information about our services, offering books and DVDs to help them with their English and conversation. I've done storytimes to rooms full of kids, and I can always pick the ones out who aren't read to at home, they carry themselves differently, they're shockingly easy to pick out. They only showed up at the library that day because mom or dad needed the computer to print off forms for a Home Heating Rebate, or fill out their EI or look for work. The real magic happens when I help those kids find some books to take home, and mom or dad look around the place and see everything we might have for them as well and everyone leaves with bags filled with library materials for free; parents and children in awe of what we have to offer. "I've had people come to me looking for information about addiction, mental illness, grief, bankruptcy, cancer, divorce and custody issues, and I know they're experiencing the worst times of their lives. Perhaps the information I help them find will them will give them clarity, perhaps it won't, but I've spoken to the ones who want to talk and cried with more." I've had people come to me looking for information about addiction, mental illness, grief, bankruptcy, cancer, divorce and custody issues, and I know they're experiencing the worst times of their lives. Perhaps the information I help them find will them will give them clarity, perhaps it won't, but I've spoken to the ones who want to talk and cried with more. Hopefully, if nothing else they remember the kindness, because I'll never forget the trust they offered to me by sharing their stories. I'll never forget the way they've touched my own life. We all have our struggles, no one is immune, and when troubles come for me I hope I can have somewhere like the library to go for information, and a little kindness. I am not alone, librarians talk, we all do these things and share the same heartbreaking stories over and over again. In truth, I was Pollyanna. I'm not ashamed to admit it; I wore those rose-coloured glasses proudly. And some days I have to force myself to put them on to go to work, because it's not always about the magic and the imagination of books, some days it's about lessening someone's burden and remembering just how lucky I have been, and how lucky I am now. More than anything, our patrons touch our lives, they become a part of our families and create a magic for me I could not believe existed at the library until I worked at one. I read MHA Scott Reid's comments about his library's closure, and it gave me pause. After really examining what his library offered to his constituents, he had a change of heart. People of privilege often cannot grasp what we do everyday, because they may not need us the same way, or understand the small, but important difference we make. I don't blame them for that, in fact I'm happy for them, I'd love for everyone to have that experience. Sadly, right now that's not the case, and it's only going to get worse before it gets better in this province. I understand the hole we're in, I understand it may take drastic measures for the province to recover and I'm personally prepared for that. I don't place blame on the Newfoundland and Labrador Public Libraries Board for the decision to close 54 of our libraries; their already impossible budget was decimated last month and I know they had difficult decisions to make. I don't envy their position. 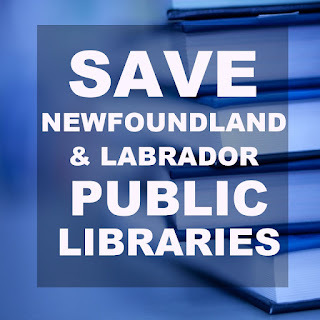 The only comfort is that it appears the public outcry is being directed at the Provincial Government and not our board who fully believes in what the libraries offer to the people in this province, and share a commitment to keep that service going the best way we are able. We may be reduced, but we will continue to do all we can to bring the best service possible. I'd love to encourage all MHAs in the province to spend some time with local library boards, or better yet, to spend a good chunk of a day browsing the stacks, and reading a book just to see exactly what we do each day, and who we see. The people we try to help, and the community we serve. That's the real magic of the library. A magic I didn't understand as a life-long, card-carrying habitual library patron. The Public Library System is so much more than I could have ever imagined, and whatever happens, I'll carry that with me and be proud that I was a part of it. Doing what I love doesn't put a lot of money in my bank account at the end of the day; at times it seems like the work is too hard to bear and I cry on my drive home more often than I'd like to admit. But there's nothing else I'd ever want to do. My job is more than just my paycheque, it's fulfilling on a much larger scale. It's not important if my library is one of the 54 to be closed, or one of the lucky 41. The truth is that my library isn't special, or remarkable in any way. The truth is that this is just what happens in every library in this province. And knowing that 54 towns will lose this, permanently, is too much to bear. Want to assist? The Newfoundland and Labrador Library Association could use your help. or click here to take action to save our public libraries. Here is the list of the 54 libraries on the chopping block.